Here's my card for this week's Waltzingmouse sketch challenge. The unseasonably warm weather (70's in December!) 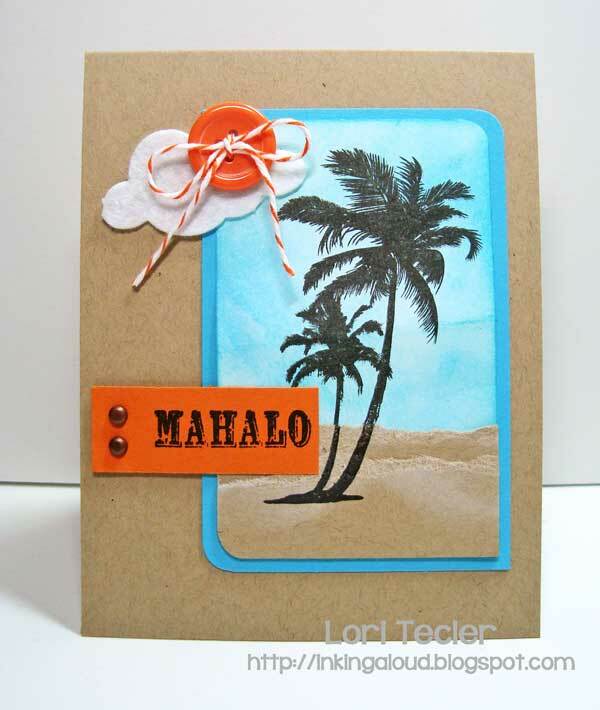 we had earlier this week served as my inspiration for this beachy themed design. I used the large palm tree image from the My Island set for my focal image. The backdrop for the tree is made with a combination of sponged distress inks for the sky and torn and inked kraft cardstock strips for the sand. The tree stands out nicely stamped in bold black ink. I layered the image panel on a kraft card base, then added a felt cloud along with an orange button sun at the top left corner of the panel. The set's "mahalo" sentiment is stamped on an orange strip and accented with a pair of copper brads. And, now that the card's done, we're back to more seasonal, chilly weather, so I guess this will be the end of cards like this one for a while! Fresh and no-christmas :) Finaly !! :) love it soooo much :) started dreaming about summer vacation ! grat colours and button is my favourite !! Lovely! It's been very warm here too - but I think the winter temps are back now. Love this warm and fun card! Lori... This is fabulous!! Perfect use of the images and sketch! Ahhhh....I just wish I was going on a tropical vaca!! Your sand dunes look REAL, Lori! Can't even tell you how happy I am to see a warm card right about now :) It was in the 60's and 70's earlier this week and we got spoiled...because it quickly dropped back to the 30's and I can't even take it, hee! Oh, and there's a button sun...big smile!! Adorable card for the warm season!